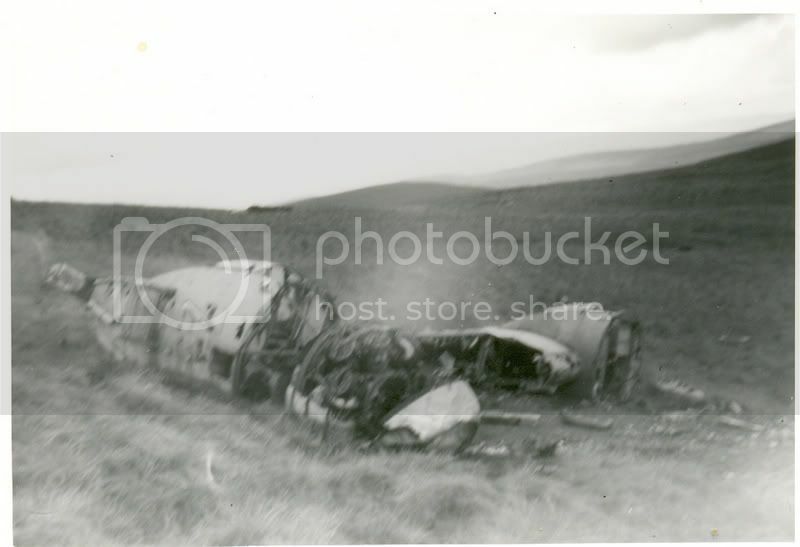 On the evening of Wednesday 21 April 1948 a British European Airways Vickers Viking aircraft flight S200P out of Northolt bound for Renfrew Airport struck Irish Law in the North Ayrshire hills. Miraculously, all 20 passengers and crew on board escaped before the aircraft was consumed by flames. Today, substantial wreckage is still present on the windswept hillside. For the 60th anniversary of this amazing incident, I am researching the events of that night with the view to writing a substantial, non-profit making piece of work. Some information has already been sourced, however, I am keen to have input from people who had first hand experience of the events that night or thereafter, plus information from passengers relatives. If you can help in any way at all, I would be pleased to hear from you. All sources of information will be acknowledged in the finished work. Website just been updated with new information and links. Interesting website with good links on wreckology in the area. Wish I could help you with more information. Thanks - I'll continue to post any updates on here. The train crash was quite something too, happened about 10 or so years ago, passenger train failed to stop, went straight through station and was hanging outside a newsagents into the main street! The project is progressing well. We have had some excellent press coverage including the Evening Times, Largs & Millport News, Sunday Post, and a large article is forthcoming in the Scottish Sunday Express on 10 June. We have been able to speak with a relative of one of the passengers, a friend of another and have a few more leads to follow up. Hope you can post a link to the article when it is published! Unfortunately, it doesn't appear to be available on the web. It's a generous piece, being a double-page spead with just a quarter page missing for an advert. Hopefully it will bring us some more leads. 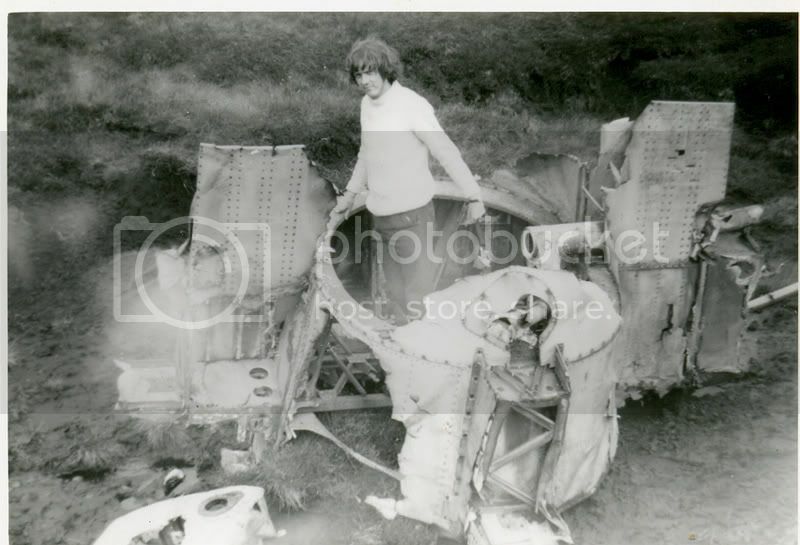 FWIW here are a couple of scans of old black and white photos of sections of the wreckage. My youthful appearance in the second photo, taken by John Martindale, suggests the photos were taken about 1969 or 1970. Qualified as RAF pilot 1940Had Class B pilot's licence endorsed for DH89, DH89A, Dakota, Ju52 and Vikings. Landed at Renfrew nearly 400 times in two years. Lived in Newton Mearns, East Renfrewshire. Flew Rapides from Donibristle, Fife. Flew for the FAA for Communciations Flight. Does any of this trigger any memories with anyone? If so, no matter how small a fragment, we'd like to hear from you! Many thanks. Scans of our project press coverage can be found at http://www.atcu04.dsl.pipex.com/vickers_viking2.htm and subsequent pages. Enjoy! survivors down from the crash site to safety. near London, which we had planned to undertake in November. did supply and troop droppings duties and glider towing in C-47s. his actions on this day, Cliff received a Queens Commendation medal. him also as a true gentleman. The first edition of our newsletter, Viking Crash Research News, is now available. Please send a PM with your email address if you would like a PDF copy. I see from your latest addition to your site the crew list (apart from the ages) is identical in format and detail to the one I produced for XF702 after a fair bit of research, no one source gave all of the details so I know it wasn't looked up easily. I had to use the accident report, newspaper articles and the new armed forces memorial, that helped iron out a couple of errors in the accident report with service numbers. By the way Iain C. MacLean (the only crewman you don't have an age for) was 20 at the time of his death. For Sqn Ldr Harry Harvey the accident report records RAF Kinloss Wing AE Ldr though on my site I only put RAF Kinloss Flying Wing. A little bit late, but...! As the days draw closer to a new year and the 60th anniversary of the crash of Viking G-AIVE on Irish Law, we thought we’d announce that we will be holding an event at Lochwinnoch RSPB Visitor Centre at 1pm on Sunday 20 April 2008 – the day before the 60th anniversary of the incident. On the day, James and Dougie will be giving an illustrated talk on the project which will also include the first public airing of video footage of Vestal’s steward, the late Con Moroney, talking about his experience of the crash. We also hope to have a couple of surprises on the day! At this stage in the project, we’re piecing together all the information obtained from a plethora of sources and assembling it into readable, logical format! Looking through the folders of paper copies, correspondence, maps and technical data, and delving into numerous computer files it is really pleasing to have located all this valuable information in a comparatively short period of time. There are still a few little areas to be clarified, but the ‘research phase’ of the project has more or less been concluded – that’s not to say if more information becomes available that we won’t be interested! Of course, our research would have been far less profitable had it not been for us communicating with a great many people who have helped us with details of their relatives, friends, colleagues and the events of that night nearly 60 years ago. To all of them, a great many thanks. We are also pleased that so many other people have expressed an interest in the project, with over 70 recipients of our Viking Crash Research News publication in locations as far away as Ireland, the US, Canada and Australia. Our press coverage, from local newsletters and papers to national publications proves that there is great interest in what - pardon the cliché - was a ‘miracle escape’. In other news, Dougie has nearly completed a 1:72nd scale model of Viking G-AIVE. A resin and white metal kit was used as the basis of the model, with extra details added in brass rod. The painting has almost been finished, with only the decals left to apply. These decals were custom designed so that Vestal could be depicted in the livery worn at the time of the crash. The model will be on display at our April event. Through Lady Hunter, we have made contact with Mrs Brenda Moore, who has kindly provided us with details about her late husband Hobart Moore and his colleague Jimmy Wilson. We had guessed that Mr Moore and Mr Wilson were travelling together on business but she has been able to confirm this. We have also been able to trace some details of the last years of the Captain of the flight, John Ramsden. An appeal for information is due to appear in the March 2008 edition of Icarus, the publication for retired employees of British Airways (and BEA/BOAC) and we hope that this might produce further details of both John Ramsden, and the Radio Officer, Arnold Lloyd. Both of these players in the story have been possibly the most difficult to locate information about. It just remains for both of us to thank you all for your kindness and interest in our project. We wish you very best wishes for 2008. Over the past 18 months we have been researching the crash for our book Viking Down!, with an intended publication date in 2009. To commemorate the 60th anniversary of the crash, we are holding an event at the RSPB Nature Reserve Centre at Lochwinnoch at 2pm on Sunday 20th April 2008. This is a free event and all are welcome. To book a place at the event please call the reserve on 01505 842663 or email lochwinnoch@rspb.org.uk. During the event, we will be holding an illustrated talk detailing many aspects of our project. This talk will cover how and why the crash occurred, and show just how ‘close a call’ it had been for them all. But we will also concentrate upon the human element of the story by discussing the lives of the passengers and crew. We will discuss how they escaped from the burning plane, how they fared on the hillside, and their treks to safety. The steward’s two sons are both intending to travel from Buckinghamshire to the event. They are kindly allowing us to show some fascinating video footage of their father Con Moroney discussing the crash. Dougie’s father John Martindale will also be delivering a slide show covering some of more interesting wrecks he found in the 70s with the investigation group SWAIG. This will feature a few of the local wrecks, the Hudson on Ben Lui, and the story of how the group were involved in the recovery of a German bomber’s engine from the Moray Firth.